Anna+Samar’s BusTrip 1472, originally uploaded by Iain Fergusson. I’m busy, so you only get one photo. It was lots of fun. I had two off-camera flash set-ups. One for on the bus, which was a bit more bullet-proof, and one for inside the pubs. It required a change whenever I got on or off the bus, but it wasn’t a big problem. The in bus setup was an SB-400 on a TTL cord. Small, light, and there is no auto-focus assist light on the flash, so the on camera assist light is used. This is what I used for the photo above. Inside setup was SB-800 as master on camera, with SB-600 and Big Bounce diffuser in left hand. 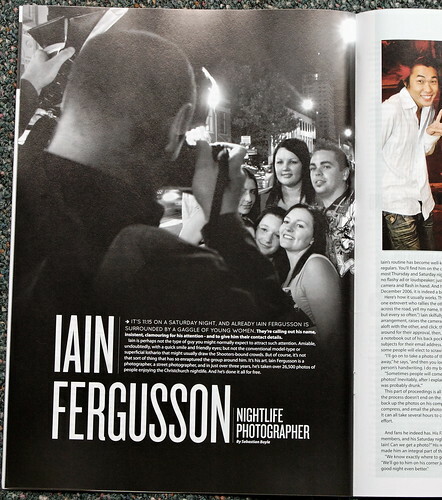 Canta Magazine article about me, originally uploaded by Iain Fergusson. Canta magazine (the University of Canterbury Student Association magazine) did and article about me! IT’S 11:15 ON A SATURDAY NIGHT, AND ALREADY IAIN FERGUSSON IS SURROUNDED BY A GAGGLE OF YOUNG WOMEN. They’re calling out his name, insistent, clamouring for his attention – and to give him their contact details. Iain is perhaps not the type of guy you might normally expect to attract such attention. Amiable, undoubtedly, with a quick smile and friendly eyes; but not the conventional model-type or superficial lothario that might usually draw the Shooters-bound crowds. But of course, it’s not that sort of thing that has so enraptured the group around him. It’s his art. 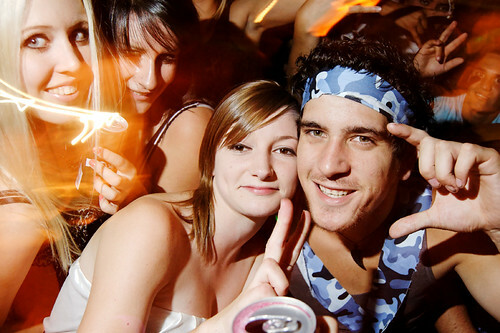 Iain Fergusson is a photographer, a street photographer, and in just over three years, he’s taken over 26,500 photos of people enjoying the Christchurch nightlife. And he’s done it all for free. Miasma Hair photoshoot, originally uploaded by Iain Fergusson. Miasma Hair make wonderful hand-felted wool dreads and falls from Ashford corriedale, Merino and silk.